Just as you are about to give up, you come across a familiar name and then BINGO! You have found your ancestor! That is what happened to me last night at about ten o’clock. I had recently found a great website which had digitilized records for the Cotes D’Amor area of France (ar mor meaning the sea in Breton) which was previously known as Côtes-du-Nord until 1990 when the name was changed. To get what you want from it’s records you really need to know the area and date you are searching for first, as there is no option for name search. This can be very time consuming but as I found out late last night it was all worth while! Place – I knew he was born in the area Plaine Haute, Cotes du Nord. Date – He was born on the 16 June 1885. The website is in French and although I know some French my knowledge is limited. Luckily Google transalated each page for me. So I selected the ‘Entree’ button to enter the website which presented you with the alphabet. I then selected the letter ‘P’ for Plaine Haute – dates from 1575 to 1905. Next step is to select the option: Registres D’etat civil de 1793 a 1905. I have to admit from here it was just a lucky guess as you are presented with a whole list of dates. I think I selected Lot 11 as it was the nearest to 1885. 8 images come up on screen, look for the ones which look like they have a list on them and select that page. Check all lists until you find the name you want. Then try and figure out whether to go back wards or forwards to find your page. There may have been an easier way to search, but I couldn’t find it. Anyway, it was all free and all very exciting because I have now found the parents of Pierre Gosselin which means I can now go one generation further back! Also I realise that the date I had was slightly incorrect and may be down to a transcription error from the Jersey Archives. The new birth date was the 26th June, not the 16th. An easy mistake to make because the writing from that time period can be quite difficult to read. 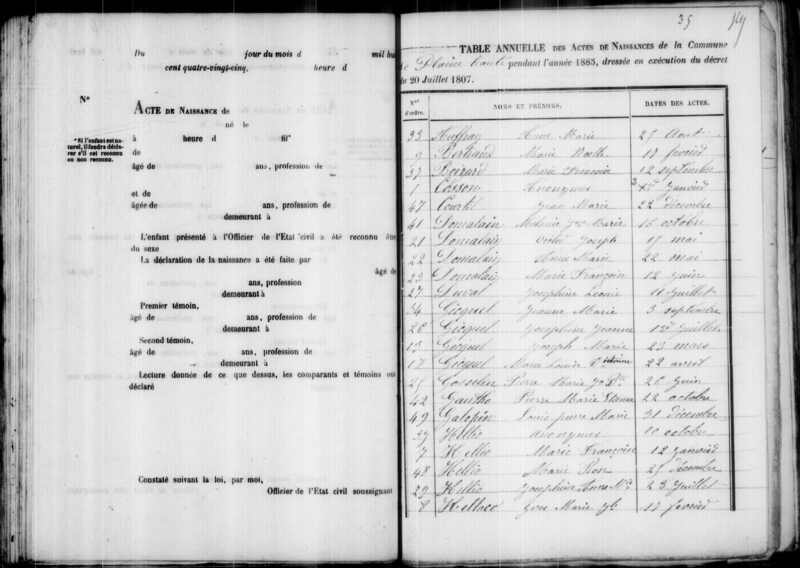 The other extra piece of information on the record is the age of Pierre’s parents, their occupations and names of the witnesses. Names of witnesses: Pierre Oger & Michel Boutier. Now all I need to do is brush up on my french! Next On this day – Violet Florence Mabey Lozuet was in born 1898. Well done Ramona – my you are determined and thanks for doing these we will appreciate it in years to come and so will your children no doubt.